EVEN as Prime Minister Kamla Persad-Bissessar expressed gratitude to supporters for electing her into government, she encouraged them to keep the campaign trail going for the upcoming local government elections next month. 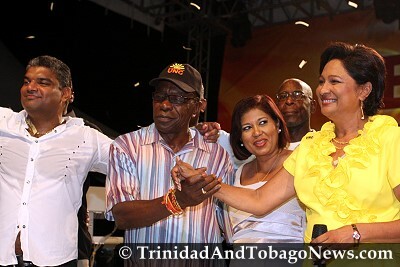 Prime Minister Kamla Persad-Bissessar fought back tears on Friday night as she thanked thousands at Rienzi Complex in Couva for enabling the People’s Partnership victory at the May 24 polls. I offer my warmest congratulations to the People’s Partnership for saving Trinbago from a dispicable and evil PNM. While the road ahead may be difficult, given the amount of problems that PNM bestowed on we country, the people will stand behind our new prime minister, Ms. Kamla Persad-Bissessar. Please have Constitutional, Prison, Educational and Social reforms and you will lead our country for a long time to come. All Trinbagonians abroad await your call to come home to assist in the rebuilding of we country. ok, time to stop all this crap and start to govern. We finally have a PM now after a long 2-3 weeks without one. You just stole my thunder , keeping it realer. I was on the verge of screaming out myself, and demand that our corporate agents of the 4th estate , take their faces out of the rear end of the three prong leadership, and make demands on them. You’ll think that they might want to tell them that the people are suffering from voter fatigue , even if they understand why they would wish to consolidate power in this manner now, by going for the kill now that it looks as if the PNM is attempting to redefine itself, after the humbling experience on May 24th. Wouldn’t it be interesting if the people voted in the PNM again, so as to help clip the wings of the growing pompous PPP, and make them understand that they the populace are concern about absolute power, residing in the hands of one party? I tell you,can anyone imagine what a great country we can become , if usually comatose Trinis , would finally wake up , and stop allowing conniving elites use them as ‘boobooles,’ for self aggrandizements?Sing with me folks as it sounds good. “This is change , we can all believe in,” yes? Talk about the “urgency of now,” Obama style.